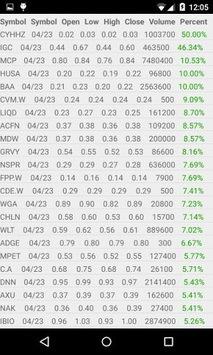 Penny Stocks App for android is use to find hot penny stocks ideas and top penny stocks today. Penny Stock Screener allows a trader to find daily top penny stocks gainers and losers, with stocks under $1, $2 and $5. 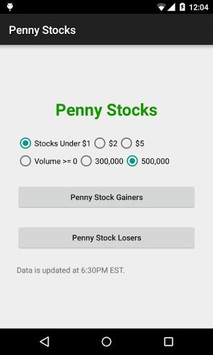 This penny stocks app does not suggest which penny stocks to buy, it lists penny stocks to watch. You will need to decide for your own which are the best penny stocks to buy or trade. Penny Stocks list are stocks that are trading on the NYSE, AMEX and NASDAQ penny stocks. 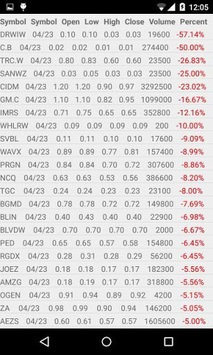 This Penny Stocks app does not include stocks from the OTCBB penny stocks. You can filter penny stocks by stock price and volume. You can search for stocks under $1, $2 and $5, and you can filter for penny stocks by volume. You will see the biggest penny stock gainers and losers of the day. You will find the top 100 most active penny stocks each day with our penny stocks app. Traders will see penny stock news for each stock symbol and penny stock charts. The penny stock app uses stock charts from Finviz. NOTE: Penny Stocks App is based on end of day data, not live data. The data is updated at 6:30PM EST on every trading day. This is not a penny stock alert app, so you won't get any stock alert from us. You will use our penny stocks app to do research and manually add stocks to your watchlist. Majority of the stocks are from nasdaq exchange because they have the most penny stocks available other than OTC stocks. Please keep in mind penny stocks are risky stocks to trade, as they can go up or down very quickly. You can make a lot money trading penny stocks when you do it right. It is much easier for a $2 stock to go up to $4 than for a $200 stock to go up to $400. However, there are a lot of risk involved when you trade penny stocks as they are very volatile. A stock that you buy for $2, may go up to $4, but it can also go bankrupt. Disclaimer: Our Penny Stock App does not endorse or suggest any of the securities which are returned in any of the searches or filters. They are provided purely for informational and research purposes. Our Penny Stock App does not recommend particular securities. Our Penny Stock App shall not be liable for any errors or delays in the data, or for any actions taken based on the data. Users should always conduct their own research and due diligence and obtain professional advice before making any investment decision. Our Penny Stocks App will not be liable for any loss or damage caused by a user reliance on information obtained in the App.